The Daily Star have recently said that Manchester United had a chance to bring Cesc Fabregas and Toni Kroos last summer but the new manager Louis van Gaal didn’t show that much interest in signing the duo. The previous sacked manager of Manchester United, David Moyes had both Fabregas and Toni kroos in his target list. He wanted to bring both of them to strengthen the midfield but when Van Gaal took the managerial role he didn’t show any interest in bringing the talented duo at Old Trafford. Eventually, both Fabregas and kroos left their previous clubs and started their new career. 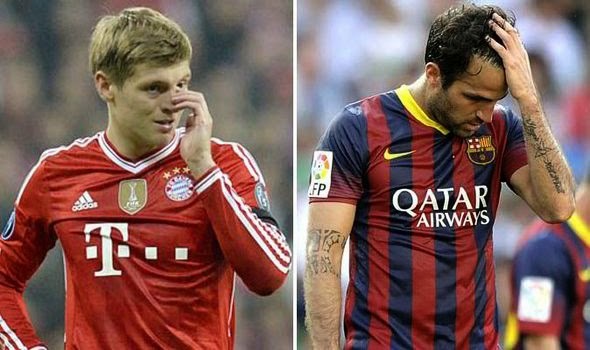 Fabregas went to Chelsea from Barcelona while Kroos joined Real Madrid from Bayern Munich. Apart from these two, Moyes also had Ander Herrera in his target list. Van Gaal didn’t come in between in this deal and let the club complete the signing of the Spanish International. On the other hand, some new signings, Radamel Falcao who was brought Van Gaal isn’t looking settle in Manchester. He is spending difficult time at Manchester United and his long term future with the Red Devils is uncertain. According to Falcao’s agent Jorge Mendes, if Falcao decides to leave United, he will surely play for a big club next season. The Colombian International isn’t feeling good in Premier League and may decide to leave Old Trafford.